Lt. Gen. Joseph Guastella, U.S. Air Forces Central Command commander, speaks with a top performer’s supervisor at Creech Air Force Base, Nev., Jan. 16, 2019. Guastella coined several 432nd Wing/432nd Expeditionary Wing and 799th Air Base Group outstanding Airmen who deliver persistent attack and reconnaissance against the nation’s enemies. Lt. Gen. Joseph Guastella, U.S. Air Forces Central Command commander, and Chief Master Sgt. 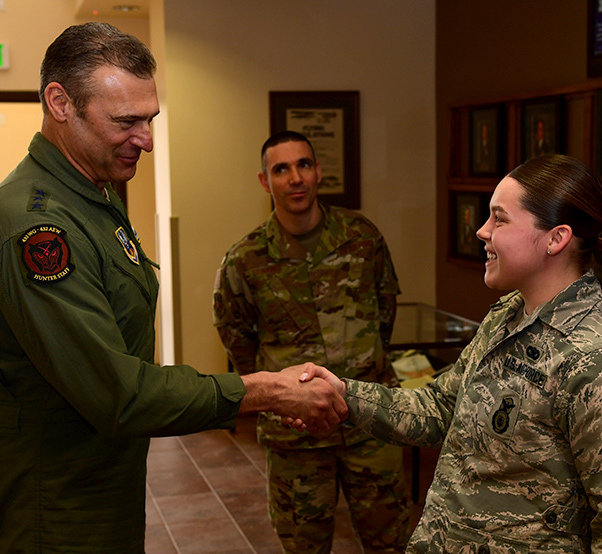 Shawn Drinkard, AFCENT command chief, visited Creech Air Force Base, Nev., Jan. 16, 2019. 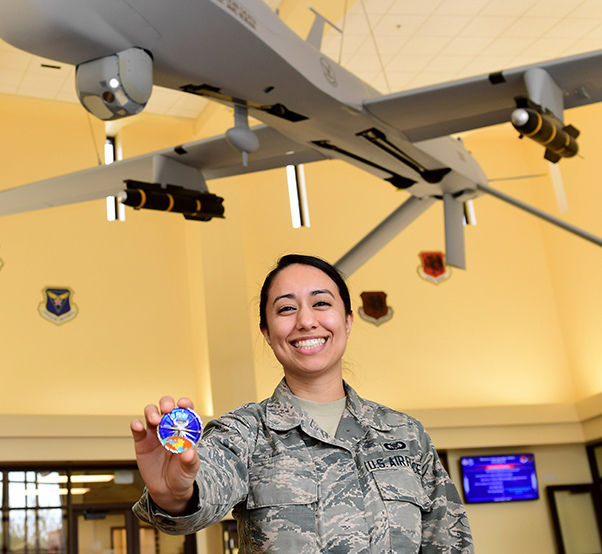 An aviation resource manager with the 78th Attack Squadron, shows the coin she received from Lt. Gen. Joseph Guastella, U.S. Air Forces Central Command commander, at Creech Air Force Base, Nev., Jan. 16, 2019. Guastella coined several 432nd Wing/432nd Expeditionary Wing and 799th Air Base Group outstanding Airmen. Chief Master Sgt. 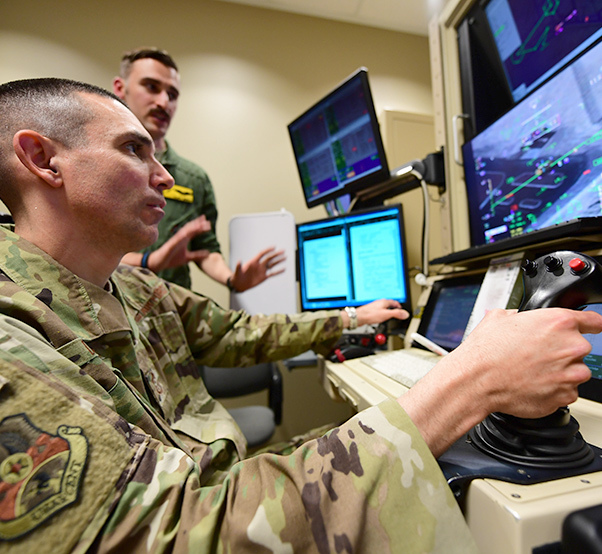 Shawn Drinkard, U.S. Air Forces Central Command command chief, pilots a simulated Reaper in a flight simulator, at Creech Air Force Base, Nev., Jan. 16, 2019. These simulators ensure Reaper pilots and sensor operators remain current with flight training and utilize skills in realistic combat situations. 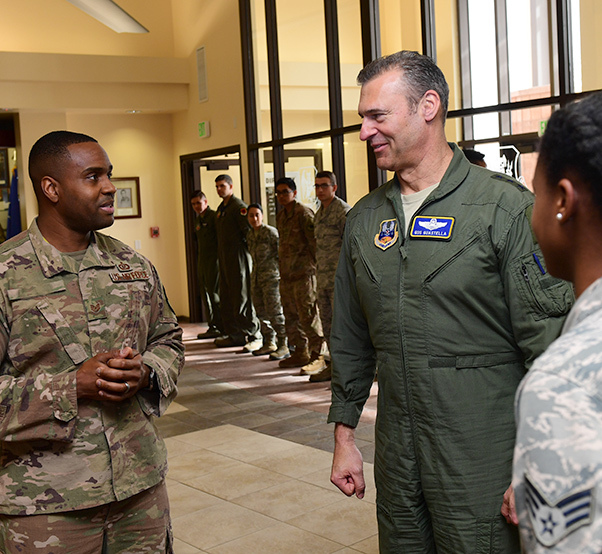 Lt. Gen. Joseph Guastella, U.S. Air Forces Central Command commander, speaks with a top performer at Creech Air Force Base, Nev., Jan. 16, 2019. Guastella coined several 432nd Wing/432nd Expeditionary Wing and 799th Air Base Group outstanding Airmen. Chief Master Sgt. Shawn Drinkard, U.S. Air Forces Central Command command chief, addresses Airmen of the Remotely Piloted Aircraft enterprise, at Creech Air Force Base, Nev., Jan. 16, 2019. 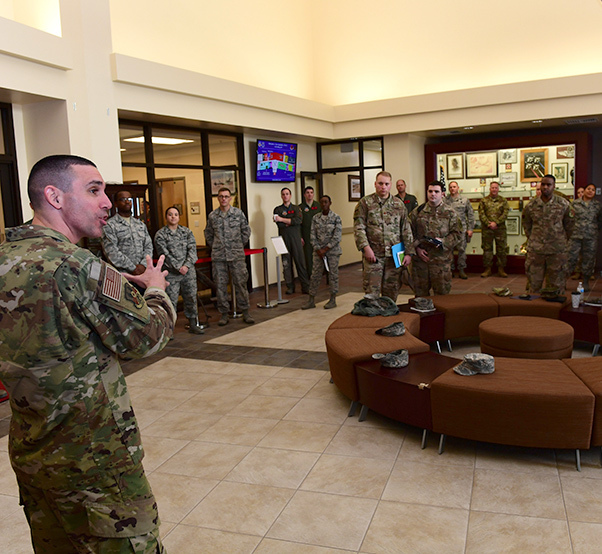 Drinkard visited with the 432nd Wing/432nd Air Expeditionary Wing and 799th Air Base Group Airmen who deliver persistent attack and reconnaissance 24/7/365 against the nation’s enemies.